Competition in the mirrorless interchangeable lens camera (MILC) space has seriously heated up. Panasonic and Olympus built the compact mirrorless market with the Micro Four Thirds (MFT) system and now practically all major camera manufacturers, except Canon, have made a showing. Nikon entered the space last year with the V1 and J1, Sony launched three new NEX cameras, the NEX-C3, NEX-5N and the first 24-megapixel MILC, the NEX-7. Fujifilm also just announced the X-Pro1 camera boasting some incredible credentials while Pentax and Ricoh have carved-up a niche. 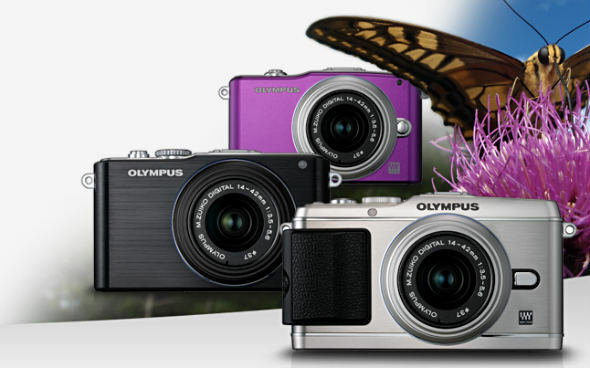 Olympus made a strong showing in 2011, having released not one, not two but three MFT cameras in June, the PEN E-P3, and two really good budget cameras, the PEN E-PL3 and PEN E-PM1. Best is yet to come from Olympus as we’re anxiously awaiting the announcement of the much-rumored OM-D at CP+ in Yokohama early next month.